Not sure if you heard, but today is most certainly the 12th of February. Ack! I think I still have Halloween pumpkins on my porch. With Valentine’s Day only two days away, we made sure to cook up a post that will hopefully make the day go a whole lot smoother. There are simple breakfast recipes, savory lunch and dinner meals, and sweet desserts to end the night. And about 99.9% of them are covered in hearts. We’ve also made sure to throw in a handful of last-minute Valentine DIYs just in case you haven’t whipped some up yet. Make a dozen Heart Donuts to eat up in the morning. Serve up a glass of milk with a Valentine’s Day heart inside. 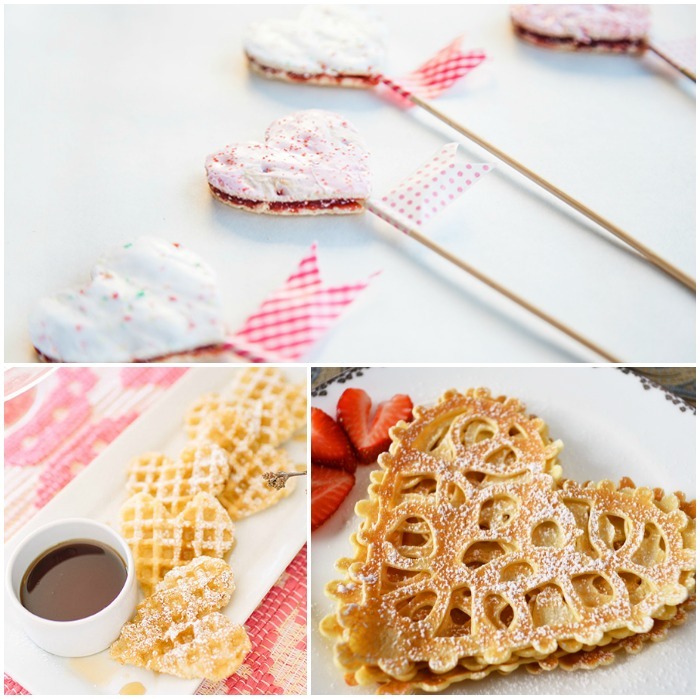 Use cookie cutters to make Pop Hearts, Heart Scones, and the Heart Waffles from 100 Layer Cake-Let. Try your hand at making Heart Lace Crêpes, or go the simpler route with Sweet Strawberry Crêpes. Don’t forget to add a few bacon hearts to your plate. Speaking of bacon, enjoy Jacinda’s Heart-Shaped Wedge Salad with Bacon Hearts for lunch or as a dinner side salad. 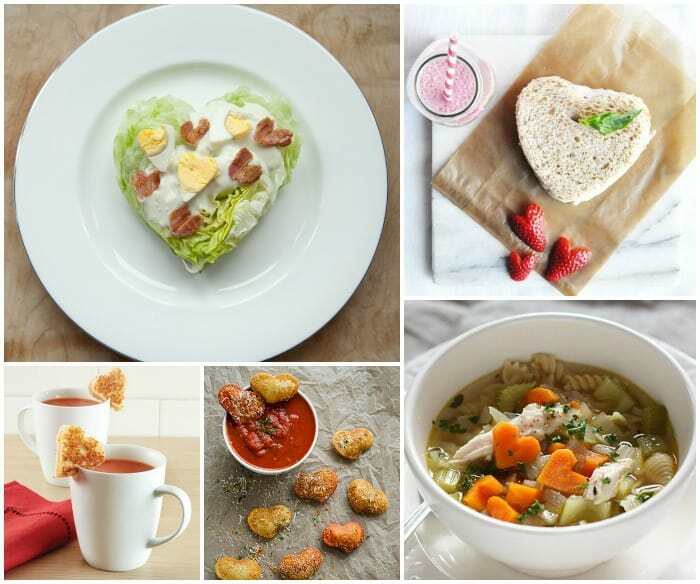 Get the scoop on making an ‘I love you’ lunch and our Peanut Butter & Apple Hearts for the kids on Spoonful. I want to make the Tomato Soup and Grilled Cheese Hearts for myself everyone I know (darn you lactose intolerance). We’ve had a whole lot of chicken soup lately, but definitely not this Chicken Soup with Heart Shaped Carrots from Sophistimom. If you’re craving something fried (who doesn’t?) try making Fried Ravioli Hearts. Instead of roasting them by the fire, make a few Valentine’s Day S’More Hearts from Kelly Bakes right in your own home. Learn the technique for how to make your own Sweet Swirl Cookies. End the day with milk and Heart-Shaped Whoopie Pies from Donuts, Dresses, and Dirt. Enjoy a bowl of ice cream topped with Candied Rose Petals and Whipped Cream (6 different flavors). 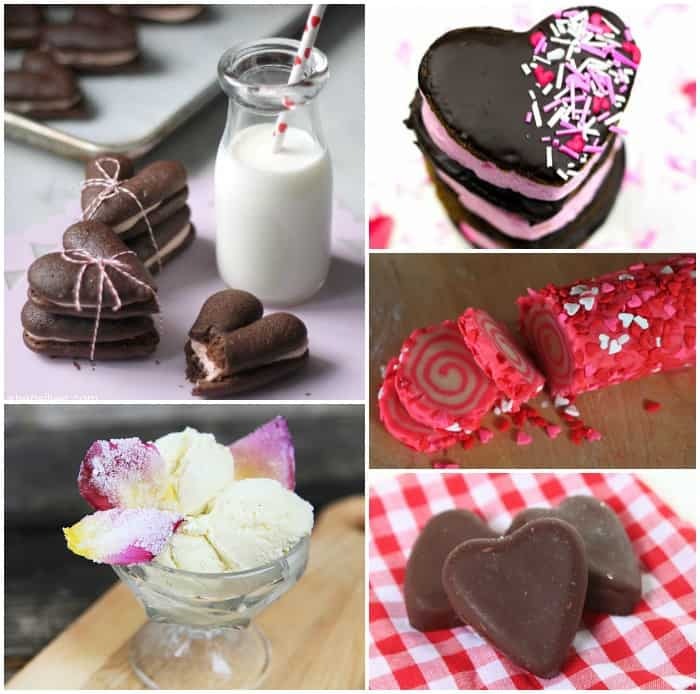 Go for a bite-size treat and make Sea Salt Maple Bacon Chocolate Hearts and Raspberry Mint Sugar Hearts. If you are making cupcakes, don’t forget to add the finishing touch with these easy-peasy DIY Cupcake Toppers. Send a message in an Origami Heart. Ditch the candy for these Candy-Free Valentines with Free Printables. Use felt to make Pirate Eye Patch Valentines. Recycle crayons for these Melt Your Heart Valentines. Print out the Color-In Owl Valentines with Free Download in seconds. Get the little ones to show their Valentine’s Day stamp of approval with these Toilet Paper Heart Stamps. Thanks for including my fried ravioli in this awesome round-up! I’m pinning this for later!